clicking on a picture will take you to more photos and information regarding the care and treatment of that particular dog. To join the sponsorship Scheme, ask for a form or click the link below where you can download a copy. 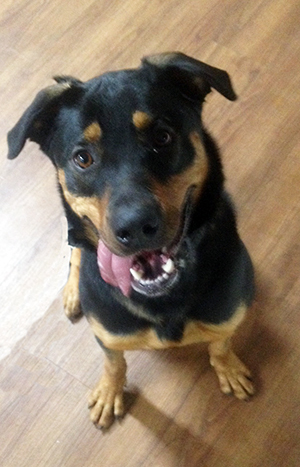 We try our best to keep costs down; we manage to keep our vet bills low because we follow an holistic life plan for the Rottweilers in our care which includes feeding raw meats and using homoeopathic treatment when appropriate. We understand that your commitment to a monthly payment or donation is subject to your needs - give only what you can afford please. YOU WANT TO HELP, BUT YOU CAN'T TAKE A DOG IN? THEN THIS IS COULD BE FOR YOU! Our Sponsorship Scheme was introduced to help individual dogs that are in need of long-term care or require urgent treatment. Some folk want to ‘do something’, but don't have the facilities or circumstance to adopt, they find sponsorship an ideal way to help. Sometimes we find the dogs we take in require medical treatment, lengthy rehabilitation, have been the subject of cruelty, or are simply elderly. Whilst these dogs are on our Sponsorship Scheme, we never ever stop looking for the right homes for them, and it must be 'the right home' usually that bit more to match the needs of 'that' dog. We have never put a dog down because it has outstayed its welcome; they are most welcome, for as long as it takes - however long 'it' happens to be! We cannot do this without your generosity, and because we can depend on the regularity of these guaranteed payments it is reassuring for us, it means we don't have to think whether the funds will stretch to another dog or if we can afford surgery straight away instead of having to raise funds for a particular case. We of course, will accept a one off donation, this is achieved by clicking any of the 'Donate buttons' which you will find on the top of almost all the pages. We also understand that your commitment to a monthly payment or donation is subject to your needs - only what you can afford please. We are aware how tight money is, believe us we know! So we are not expecting you to sell a kidney. A regular monthly donation means that you are sponsoring a dog just like the ones below, so we have provided the facility for you to do just that. 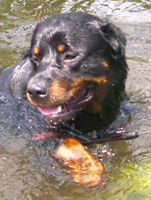 We try our best to keep costs down; we manage to keep our vet bills low because we follow an holistic life plan for the Rottweilers in our care which includes feeding raw meats and using homoeopathic treatment when appropriate. Some dogs have been helped considerably with products and advice from "PetNat.com" (see our 'Links' page) and their truly wonderful creams. In this way we can accommodate all the dogs that come our way. Purchases made in the shop will also help to maintain our funds, so please feel free to browse and buy. To join the sponsorship Scheme, ask for a form or click the link below where you can download a copy. Just fill it in, return it to the address on the form, and we will do the rest. Our heartfelt and sincere thanks to you for any and every donation made. All the dogs featured on this page are in long term care at our Shropshire kennel 'Sanctuary', where they live as normal a life as is possible. 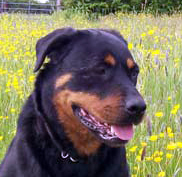 They take trips out in the car, have daily walks meet folks and freely romp in a secure wildflower meadow. But, these dogs are still looking for ‘Special homes’ and we can only manage this through the sponsorship scheme, so please, consider sponsorship or you can always find a donate button and, please .....HIT IT HARD! Our heartfelt and sincere thanks to you for any and every donation made. These are some of the dogs that have been helped and sustained by your generosity through the sponsorship scheme. If you click on the name or the photo, it will take you to more photos and information regarding the care and treatment of that particular dog.